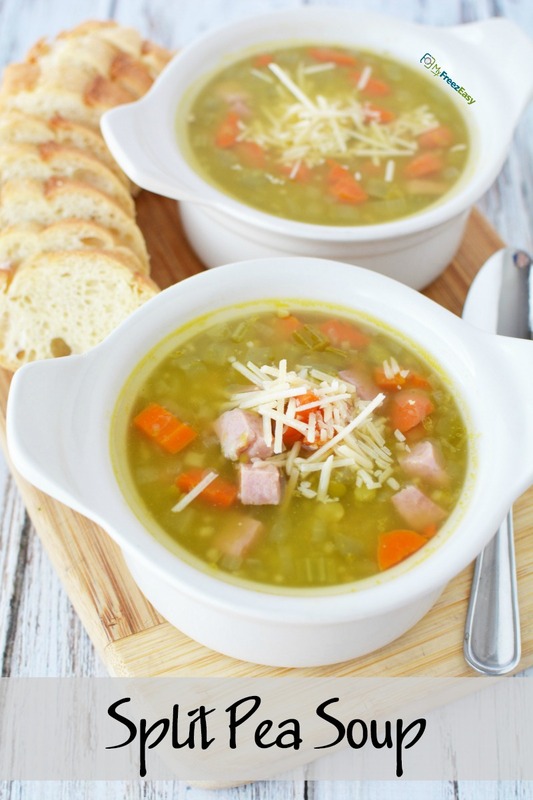 Love this warm, hearty soup! You can get the base of the soup into the freezer, then add the dried split peas when you are cooking it! Enjoy! Peel and chop the carrots. Dice the onion. Chop the celery. In a large saucepan, saute the carrots, onion and celery in olive oil for 4 to 5 minutes. Season with garlic powder, salt and pepper. Stir in the chopped ham and toss with the veggies. Pour in 10 cups hot water and the dry split peas. Cover and cook for 30 minutes, then remove the lid and cook for another 30 minutes or until split peas are softened. If preferred, add cooked soup to blender and puree. 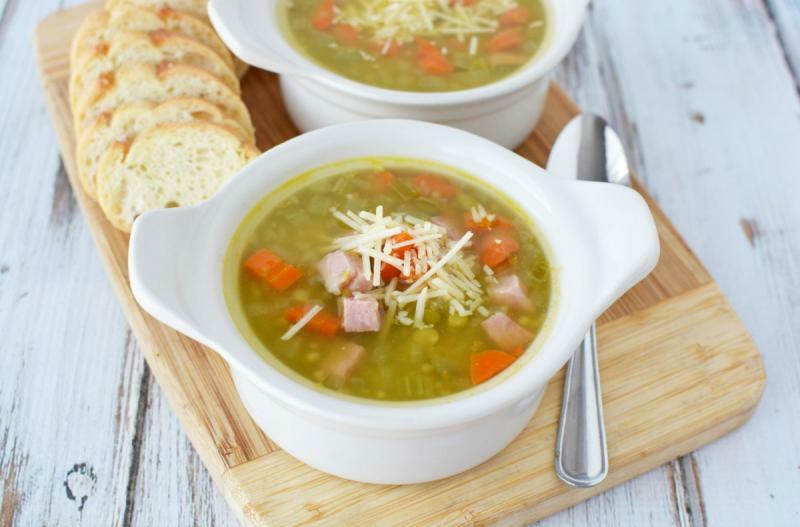 Serve Split Pea Soup with Parmesan cheese and sour cream garnish and side salad. Chop 4 cups ham, if needed. Peel and chop 8 whole carrots. Dice 2 onions. Chop 8 celery stalks. Do NOT add the dry split peas to freezer bag. Put baggie in the freezer and freeze up to 6 months in fridge freezer or 12 months in a deep freezer. Thaw in the fridge overnight, or a warm bowl of water for about 20 minutes, before transferring to a saucepan and reheating the veggies. Stir in 10 cups hot water with 1 lb. dry split peas. Cover and cook for 30 minutes, then uncover and cook another 30 minutes. Omit the Parmesan cheese and sour cream garnish for dairy-free meal. Thaw and reheat veggies and ham in saucepan, then add 10 cups hot water with 1 lb. dry split peas. Cover and cook 30 minutes, then uncover and cook 30 more minutes. Serve with Parmesan cheese and sour cream garnish, and salad.